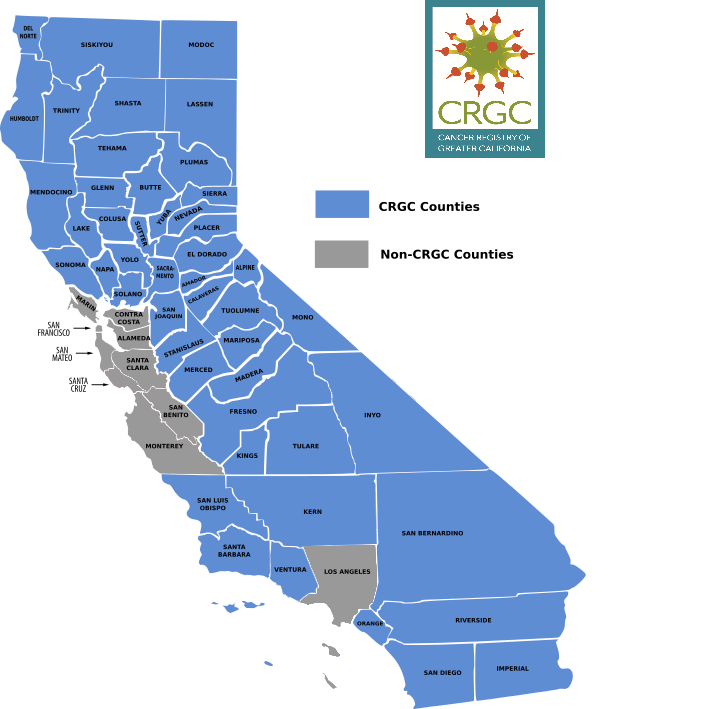 The Cancer Registry of Greater California (CRGC) provides cancer data in support of bona fide research activities to researchers who meet state prescribed requirements including standards for protection of patient privacy, data security, and confidentiality. Data available from the CRGC include compiled datasets (with and without individually identifiable data) for analyses and linkages as well as case listings for patient contact studies. Policies and procedures make a distinction between permissions of access and disclosure. Please note that all cancer registry data in California are confidential, not only identifiable data or identifiers. Data access refers to permission to examine data but does not confer a right to retain or duplicate data. Data disclosure refers to permission to examine data and retain a copy for an authorized use such the conduct of approved research. If you are looking for data within CRGC’s catchment area, please follow the steps below. If you are looking for statewide data, please contact the California Cancer Registry (CCR). 1. Complete the Initial Request Form for Cancer Registry Data. Guidance regarding other administrative requirements including additional, required documentation, and payment of fees. 2. Complete the application and required supporting documents. For additional information, review CCR Policies and Procedures for Access to and Disclosure of Confidential Data. 3. Submit all required documents to CRGC. Email all documentation to research@crgc-cancer.org. CRGC research staff will review your application and forward to the CCR to obtain CDPH’s signature on Appendix 3: Confidentiality Agreement for Disclosure of CRGC Data. Upon approval, we will make arrangements for the secure data transfer. Appropriate fees must also be paid to CRGC (see the Summary of Service Fees). Please allow approximately 4-6 weeks to process a data request and 8-10 weeks from the time of project approval to receipt of data. What are the costs associated with requesting data? Please see the Summary of Service Fees. Who must sign the Appendix 2: Confidentiality Agreement for Access to Data? The Principal Investigator (PI) may grant access to data for individuals at the same institution who are participants in the study for which data was requested. These persons must sign an Appendix 2: Confidentiality Agreement for Access to CCR Data. The PI must keep records of all signed Appendix 2 forms and may be asked to submit a list of individuals with access to CRGC data. Can you provide us with survey assistance? Yes. The CRGC frequently collaborates with another program of the Public Health Institute, the Survey Research Group (SRG). Contact CRGC research staff for more information about SRG’s services. Please contact CRGC research staff at research@crgc-cancer.org.